A place in the quarter-finals of the FA Trophy is at stake when FC Halifax Town host Chester on Saturday (3.0). Town have already banked £11,000 in prize money from the competition after beating Tamworth and Barrow, and will collect another £7,000 if they win on Saturday. 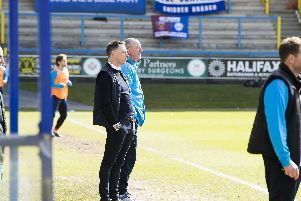 Both teams have yet to conceded in the competition, although Chester have completed a league double over Halifax this season, winning 1-0 at The Shay and 2-1 in the reverse fixture. Richard Peniket is set to keep his place in the Town side after he started against Welling last time out.